The hearth is technically the floor of a fire pit or fireplace. Hearth also refers to the extension from the center of the fire outward to the warm floor in front of the fire. The hearth is often associated with the center, or heart, of a home. 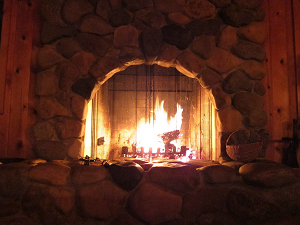 "Hearth and fire" by Edward Stojakovic is licensed under CC BY. 1988 The Barnhart Dictionary of Etymology. Bronx: H.W. WilCo..